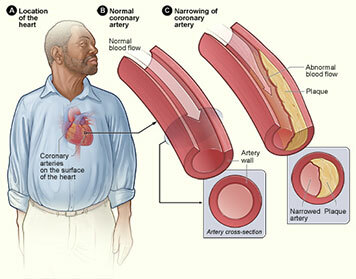 Coronary artery disease (CAD) is a buildup of cholesterol in the arteries of the heart. This leads to less blood getting to the heart. Often it is genetics that causes this to happen. There are many risk factors that lead to CAD. The most worrisome are diabetes, hypertension, a strong family history of early CAD, high cholesterol reading and smoking! At CHC, we strive to help you modify those risk factors. The management of CAD is not just medications. It involves education, testing and working with you to offer the best care possible. Our commitment is to surpass those qualities which earned your trust. Chatham Heart Center will provide you with the most innovative cardiovascular care possible.